IRTI training staff is just a Web Link Click away. It is our mission and commitment to provide our clients quality assistive technology tools and the highest level of customer care and innovative support services. Our work begins after you decide to purchase from IRTI. IRTI provides technical support and operational training for most every item you find in our catalog. IRTI product offerings include accessible manuals and tutorials many of which are published and exclusively available from IRTI. We thank you for the opportunity to be your service and support team. To help you get up and running quickly with your PC and software call IRTI at 1-800 322 4784 to sign up for personalize computer training. 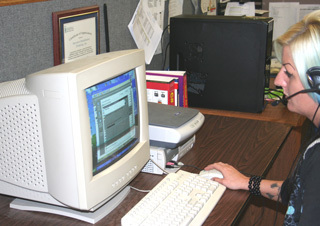 Connect your PC via the internet to one of our teachers and they will co-pilot your PC as they assist you.